Cogent is pleased to announce that we have been selected by Housing Wire for its 2015 HW Tech100 list of the most innovative technology companies in the housing economy. Over 250 nominations were received by the judges, who whittled the list down to the select 100. Of that 100, 60 were returning winners from last year and 40, including Cogent, were new inductees. We are honored to be included in such impressive company. As always, we will seek to continuously improve our technology in collaboration with our clients. 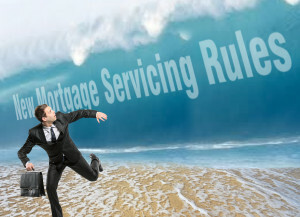 The new mortgage servicing rules that the CFPB finalized in January 2013 became effective January 10, 2014, affecting the Truth in Lending Act (TILA) under Regulation Z and the Real Estate Settlement Procedures Act (RESPA) under Regulation X. The amendments are intended to provide borrowers with detailed information regarding their loans, ensure that mortgage servicers do not unexpectedly assess borrowers with charges and fees, and ensure that borrowers are informed of alternatives to avoid foreclosure. The final rules should also provide borrowers with more timely and accurate responses to their complaints by requiring servicers to follow certain error resolution procedures. As a servicing QC and compliance professional, you have already been preparing for the additional information and data tracking requirements, as well as the process changes. With luck, your auditors are trained and ready. And your software has been updated and tested to reflect the changes. If you’re a Cogent client, this means you have updated your audit questions and implemented the appropriate question trigger rules. Maybe you’ve introduced additional findings options and workflow updates and configuration tweaks. Alternatively, you may be puzzling through how to put the pieces together most efficiently. If so, let us know at info@cogentqc.com. We are here to help. Cogent QC Systems ship with numerous standard reports, organized by category. Loan Status reports help managers to track the progress of audit activities; Audit Findings reports show audit findings from various perspectives, from granular detail to summary overview, but always for a particular period; and Feedback and Letter reports are designed to track specific audit activities. In contrast, most Management reports show quality trends across multiple periods for specific sample groups (such as the Statistical Sample or the Stratified Sample, each of which have specific definitions in Cogent.) In addition, and perhaps most importantly, Cogent’s Quality Trend reports show quality levels for particular sample periods and specify the precision with which these may be inferred to the population. It’s one thing to report the audit results of a selection of loans sampled from a population of loans (“we found 2 defective loans out of the 30 we audited, for a defect rate of 6.7%”); it’s another thing to make inferences, based on the results of the sample, to the population as a whole (“we are 95% confident that the population from which we sampled has a defect rate of 6.7%, plus or minus 2%.) In order to make valid statements like this, sampling and auditing and reporting must be controlled to eliminate bias and maintain statistical integrity. Cogent QC Systems do this for you automatically (while providing leeway to separately do non-random, non-statistical sampling.) The results are presented in Cogent Quality Trend Reports. Since most clients do not live the dream of statistical analysis on a daily basis, like we do at Cogent, it’s possible that statistical terminology is not top of mind. So we have created this infographic to help with the interpretation of Cogent’s Quality Trend Reports (click on the image for a larger version). Please pass the link around among users of Cogent in your organization. We welcome insights and feedback at support@cogentqc.com.